The SunSpec Certified™ program is designed to instill buyer confidence in SunSpec member product solutions by establishing objective criteria for verifying the compliance of communication interfaces of SunSpec member company products. Initial DER communication compliance programs addressed by the SunSpec Certified program and its Authorized Test Laboratory and Public Key Infrastructure (PKI) partners include Institute of Electrical and Electronics Engineers Standard (IEEE) 2030.5™ / Common Smart Inverter Profile (CSIP), the default communication standard for California Rule 21 and SunSpec Communication Signal for Rapid Shutdown, a de facto standard to achieve compliance with the PV hazard control requirements of the 2017 National Electrical Code®. The SunSpec Modbus interface, which SunSpec has been certifying under an earlier SunSpec certification program, will soon be added to the mix. The SunSpec Certification program takes a holistic approach to compliance testing, security, and communication of results and quality control. 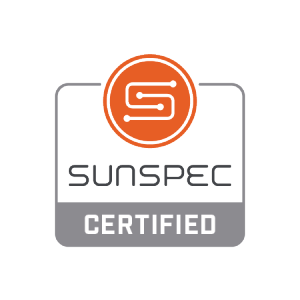 A company must be a member of the SunSpec Alliance to have its products and applications tested for certification and use the applicable SunSpec Certified logo.